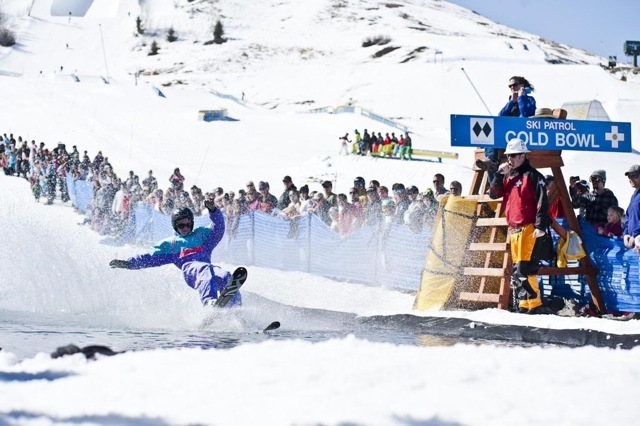 It’s the splash that signifies the last gasp of the winter season on Dollar Mountain: the splash of a skier or rider hitting the water in the fun, festive, and festooned Cold Bowl Pond Skim, held this year on April 2. In this wildly popular event, skiers and riders attempt to skim across a wide, deep trench filled with icy cold water and come out on the other side victorious. It’s not easy, but it’s a lot of fun. The Pond Skim is the scene of some of the most entertaining action of the year as some competitors make it, many don’t, and the crowd is equally enthusiastic either way. Each splash or successful crossing of the 50-foot long trench is met with a huge cheer. Those who take a swim are assisted out of the pond by members of Sun Valley’s outstanding, and sympathetic, Ski Patrol who don huge waders and huge smiles. Costumes are a must for this event and in past years have included Teletubbies, tutus, and Tigger and it’s always fun to see the original looks Sun Valley locals and guests dream up. This town loves a costume party of any kind and nowhere is that more evident than at the Pond Skim. 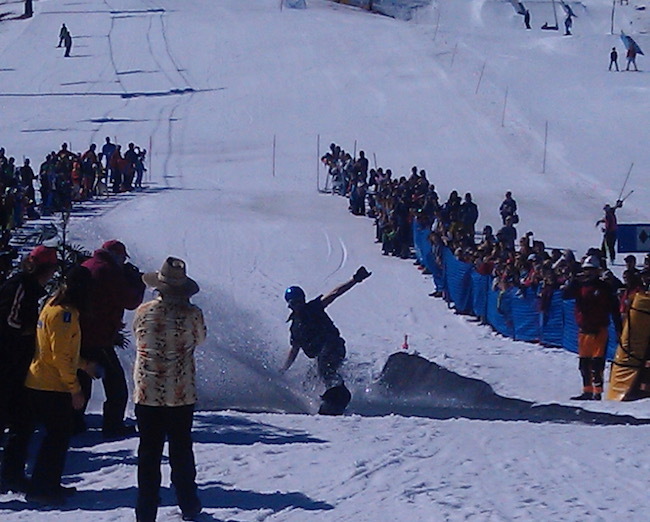 The Pond Skim is only one part of the end-of-season party that is Dollar Dayz. The celebration actually begins on April 1 with the Boxzilla Challenge on Dollar. No April Fool’s there, the action will be thrilling and authentic as the crew at Dollar will take several boxes from the fleet and set them up one after another to create one huge boxzilla feature over 100ft! The goal is to slide the whole thing! The event will kick of at noon, with free entry and signs ups in the lobby of Dollar Lodge. It will be a great event to check out with the whole family. Then, on Sunday, in addition to the Pond Skim, there is a party all day at Dollar including music, food specials, and beverages from hot chocolate smothered in whipped cream to an icy cold draft beer. Enjoy it all on the spacious deck of Carol’s Dollar Mountain Lodge where you can relax and still take in all the action. Of course, with so much snow for the 2016-17 season (300 inches! ), the skiing and riding on Dollar’s final days should also be great. Drop into the Superpipe, ride the rails, or just enjoy some groomers as you say farewell to this amazing year. Grab a costume, find your courage, and give the Pond Skim at try. There’s nothing like closing out the season on Dollar with a big splash! Thank you to the outstanding team at Dollar for such an amazing season. See you next year!